33. Which of the following places is known for Salt Water Crocodiles ? Which of the above pairs is/are correctly matched ? 41. Which one of the following chemicals is a food preservative ? 42. Which one of the following rivers drains into Rann of Kutch ? 45. What is the number of states surrounding the state of Chhattisgarh ? 47. Which of the following countries is not a part of the Horn of Africa ? Answer (c). 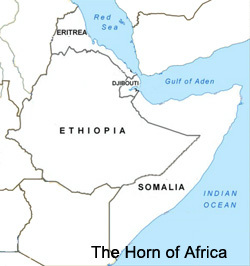 Eritrea, Ethiopia, Somalia and Djibouti are part of the Horn of Africa. Which of the above contribute to the warming up of the atmosphere ? LED-based lamps do not contain mercury. LED-based lamps cannot be used as street-lights. 52. Which of the following geographical/natural regions is declared "World Heritage Site" ? 53. Which one of the following is spread over three States ? 54. Which one of the following became extinct in India a few decades ago and is proposed to be re-introduced ? 57. Which of the following are sources of methane, a greenhouse gas ? 58. At which one of the following places are cave paintings of prehistoric times found ? 60. Which one of the following is a viral disease ?